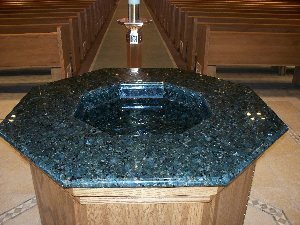 This page is dedicated to a new Baptismal Font design that we have just recently started working with as of 2010. These Beautiful Fonts can feature just about any design you would like to order. We build a custom base designed to match your existing or future furniture and top it with a custom granite top of your choosing. The granite top can be chosen from several colors, and design options are just as numerous. Below are some of the pieces we have made for our customers. All of these fonts include a pump, hidden inside the cabinet itself, that provides a constant but quiet circular flow of water. Inside we can also include shelving to store sacramental items and other equipment needed for maintenance. We currently have customers looking at even more intricate options, so be sure to check back and see some new designs! 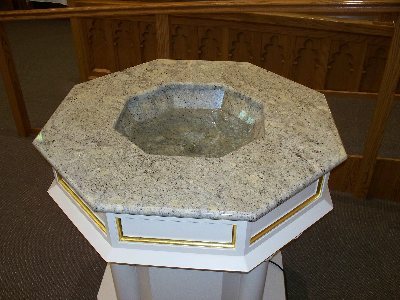 The Baptismal Font above was our first with this new design. If you look closely in the right picture you can see the whirlpool created by the swirling water. This Font was placed in the back of church for everyone to walk by as they enter, and the granite top's bullnosed edge provides a nice smooth surface. Our second font featured a similar granite top and the same swirling motion in the water. 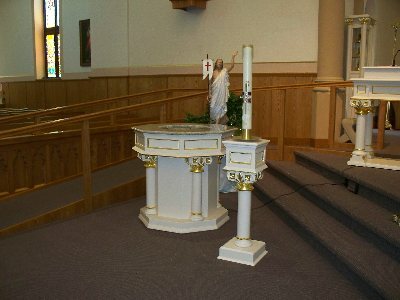 As you can obviously see, it's base was custom made to match the existing church furniture. We also fastened casters, which are hidden underneath the base, so the Font could be easly moved around at the church's discretion. 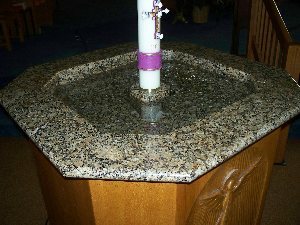 Our most recent Baptismal Font had a base that we refurbished and a different shaped granite top then our previous Fonts. While this top's shape does not allow for a swirling motion, it still has constant movement and ripples in the water. 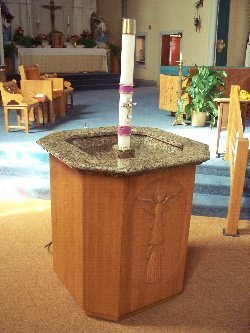 We also were asked to place a stand for the Paschal Candle to sit on. To locate the candle in the center, passage ways had to be placed on all four sides of the stand for water to drain properly. This Font was also placed on casters for ease of movement. This is a picture taken of the inside of one of the Fonts above. 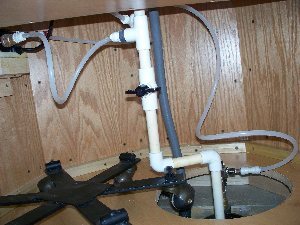 It is a pretty simple pump we have set up and it takes up very little room so it can accomodate nearly any design you have in mind. This particular Font had a water supply coming up from the ground that we were able to hook into. 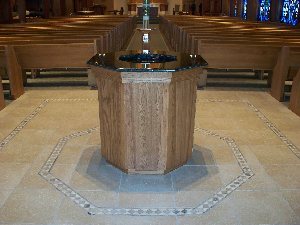 Also, we are able to place shelving in the base of the Font to provide storage for Sacramental items as well as equipment needed for maintenance upkeep. We're up for any challenge so let your imagination run free and give us a call!